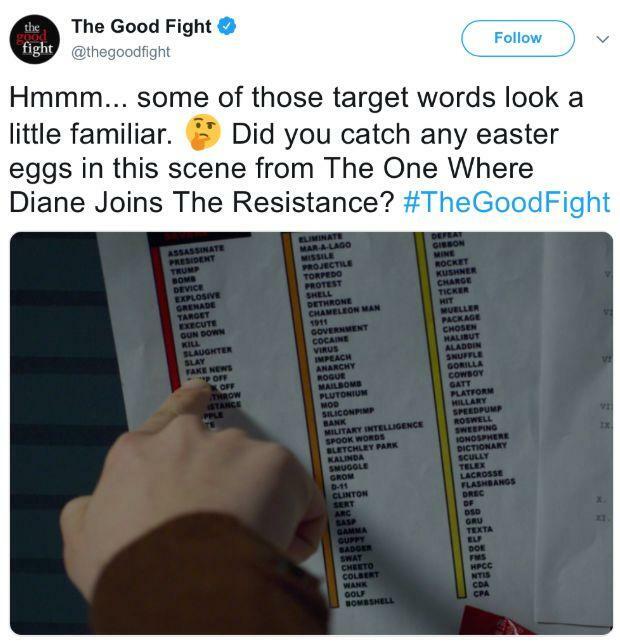 A tweet from the social media team behind The Good Fight has stirred up Trump supporters. Actor James Woods was one of the many people to post about it. The narrative being rewritten is that the show made some sort of threat against President Trump. In actuality, Christine Branski’s character Diane learns that her phone conversations with the leader of an anti-Trump women’s resistance group were being monitored by the show’s NSA (read a recap of the episode here). The list was supposed to serve as a wink to fans that the show’s NSA-like group was still investigating the character Kalinda, played by Archie Panjabi on The Good Wife. Her name appears in the second row of the list. The uproar over the list online has led to more drama. Since this happened, Nyambi Nyambi, who plays investigator Jay DiPersia on the show, is being trolled by known white supremacists. That’s because in a monologue on the show, he said — in character — that it’s OK to punch a Nazi. So now white supremacists are also claiming CBS is “inciting violence” against Nazis.